VERY FINE. 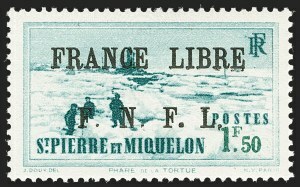 THIS IS THE ONLY F.N.F.L OVERPRINT VALUE WITH A DOUBLE OVERPRINT. ONLY EIGHT UNUSED EXAMPLES ARE RECORDED. 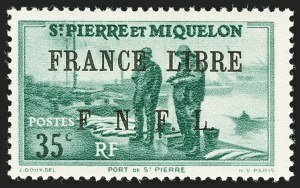 Of the 25 printed in one pane, only ten examples have been recorded. 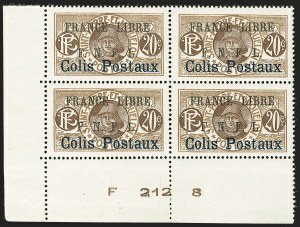 There are eight unused examples and two used examples - one off-cover (ex Wyer) and one on cover (part of this collection). 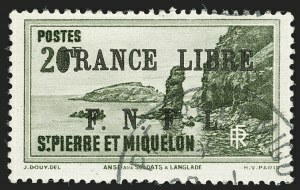 In regard to the number of examples printed, this is one of the rarest of the F.N.F.L. overprints. 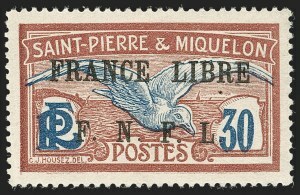 Even the 55c Prussian Blue and 3fr Gray Brown have printing figures of 45 and 27, respectively. VERY FINE. 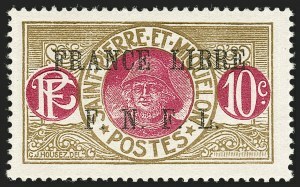 THIS IS THE UNIQUE EXAMPLE USED ON COVER OF THE 35-CENTIMES WITH F.N.F.L. 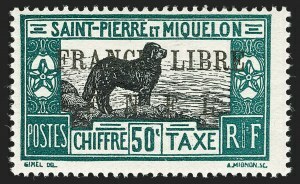 OVERPRINT DOUBLED. 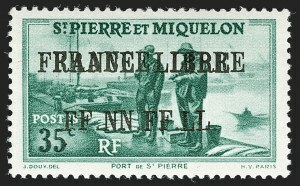 A MAJOR ST. PIERRE & MIQUELON RARITY. Only one error pane of 25 was printed though some were destroyed. 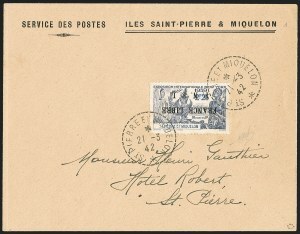 To date, only ten examples are known - eight unused and two used (including the cover offered here). 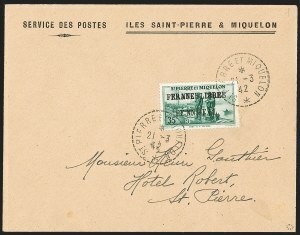 The other used example is an off-cover single (ex Wyer). VERY FINE AND CHOICE. 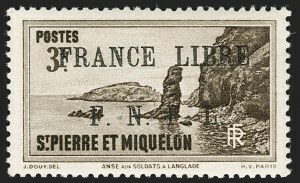 A SELECT EXAMPLE OF THE 1942 3-FRANC SEPIA WITH F.N.F.L. OVERPRINT. 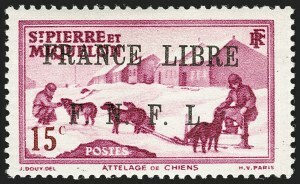 ONLY 27 WERE PRINTED AND IT IS THE KEY STAMP OF THE SERIES. 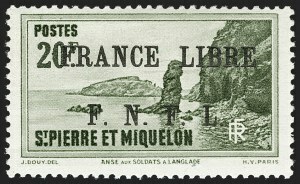 Not including the errors, this is the rarest stamp of the F.N.F.L. 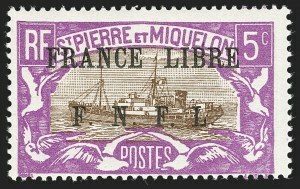 overprints. 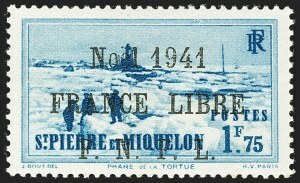 Of the 27 printed, 18 have been recorded. VERY FINE. 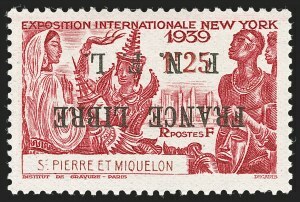 THIS IS THE SOLE USED EXAMPLE ON COVER OF THE 2.25-FRANC NEW YORK EXPOSITION WITH INVERTED F.N.F.L. 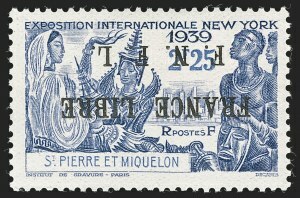 OVERPRINT. VERY FINE AND CHOICE. 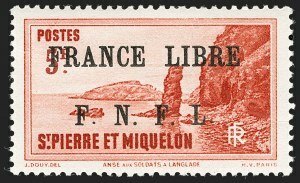 A REMARKABLE PLATE BLOCK OF THE F.N.F.L. 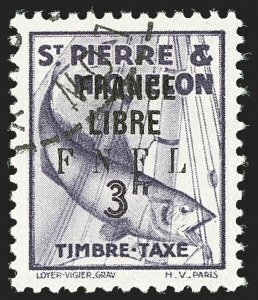 OVERPRINT ON THE PARCEL POST STAMP.